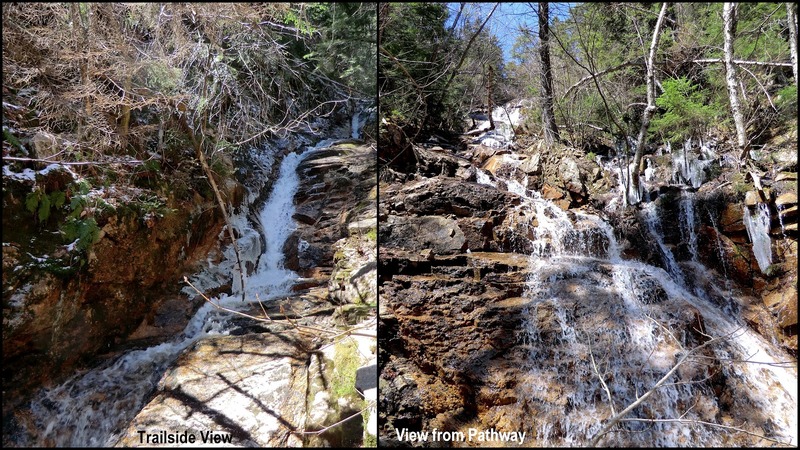 1HappyHiker: A Trek to Ethan Pond: But Wait, There's More! A Trek to Ethan Pond: But Wait, There's More! You've heard TV ads which say stuff like: "You can have this product for this very low price, but wait, there's more!" Before setting forth on a trek to Ethan Pond on a windy 29th day of April, I couldn't help thinking of the phrase: "but wait, there's more"! As often stated in my Blog reports, for each of my treks I try to visit a location that is new to me, or at least visit a familiar location via a route that I've never traveled. And so, for this visit to Ethan Pond, I needed to come up with an "add-on" that would be new and different for me. My decision was to explore the branch of the North Fork brook that is located in a valley just a bit northwesterly of Ethan Pond. That location would be new for me! I'll "cut to the chase" and say that the North Fork continues well beyond where I ended my exploration, but in the short segment that I travelled, there were many picturesque cascades. The following photos will perhaps provide some idea of what I saw. These images are the best that could be produced by me and my $97 point & shoot Casio camera! Oh! If you think you're seeing patches of snow in a couple of these images, you're right! It's not just frothy water, nor is it fuzziness resulting from my low quality images! From the top of one of the cascades, there was a bonus! Off in the distance was a view of Mt. Carrigain (next photo). Okay, now that you've seen the outcome of my North Fork trek, here are a few details. First of all, it was an easy bushwhack from the Ethan Pond Trail over to the North Fork. Actually, there was little need to whack any bushes! The woods were very open. At one point, I was even able to incorporate an old logging road into my route (photo below). Speaking of maps, there is a map entitled "Exploring New Hampshire's White Mountains" which is published by The Wilderness Map Company. This map actually has a label of "Ethan Cascades" associated with the area that I explored. It's the only map that I've seen with this identifier. If you want a copy of this map, here are suggestions for two retailers where it can be purchased: The Mountain Wanderer Map & Book Store, and Bondcliff Books. Before continuing with this report, it should be known that my intent is not to glorify this hike as some extraordinary feat. Although this destination was new to me, it's highly likely that others have visited this location and have seen the cascades along this segment of the North Fork. And, I'd venture to say that some have even followed the North Fork northward well beyond the point where I ended my trek. Okay, with the above disclaimer having been said, I'll continue with the rest of the report which will provide snapshots and a few details about my journey en route to the cascades on the North Fork. On the day of this hike, some winter leftovers still existed in the high country around Ethan Pond (see below). And speaking of Ethan Pond, of course I had to stop to take a few snapshots of this magnificent body of water, especially since I was already in the neighborhood. As you might be able to tell from the turbulence on the pond (next photo), it was a very windy day! I also did a short bushwhack to an unnamed little pond that I've visited many times. It's located about a half-mile east of Ethan Pond. I call it Little Ethan Pond, but I've heard it referred to as Lucy Pond in remembrance of Lucy Crawford who was the wife of Ethan (for whom Ethan Pond was named). The next photo was taken from the shore of this miniature pond. Looming in the background is a portion of Mt. Willey. At the beginning of my trek, I took a trailside photo of Kedron Flume from the Kedron Flume Trail. Also, at this point in the journey, I did something else that was new for me. For whatever reason, I had never taken the time to wander up the pathway on the north side of the brook that feeds Kedron Flume. Now, I know the reason for the path! There's more "fluming" going on up above the view that you see from the trail! The next photo collage compares the trailside view with the other view that can be had by a 5 minute traipse up this little pathway. And lastly, I took the following snapshot of Webster Cliffs on my descent as I approached the trailhead parking lot. This was done jokingly to commemorate Worldwide Pinhole Photography Day. But, I kid you not, 29-April was an official date for this event (click HERE). To sum it up, I'm not always successful in finding a new destination or a new route for each hike that I do. However, it is often surprising how much "new" there is to do, even within a relatively small area. Just in the vicinity of Ethan Pond alone, many new adventures have been launched (click HERE for a link to one of them). It's fully realized that not everyone enjoys this type of hiking. But for those of us who do, it's fun to approach each hike with an attitude of: "But wait, there's more!" That's an outstanding waterfall shown on the top most photo. So often these un-named or un-celebrated falls and cascades are more impressive than the most visited or more well known. I happen to have a pretty good one just accross from my house. Many years ago I followed the brook up from Kedron Flume to the Willey Range Tr. after being drawn along by the "pathway". The photo definitely sparks the memory. And by the way, that trek that you took up Kedron Brook is something that has been on my list to do for quite awhile. Your comment just raised it a few notches! John, not just saying this, but the above is one of your best reports yet (in my opinion, of course). And such a wealth of information packed into it... a great open brook that is easily overlooked on the map, old logging roads, beautiful cascades! And a multitude of stunning photos from the "$97 camera"! Photography is all about the vision of the photographer, not the equipment - that vision shows vividly here! I am intrigued by a modern map naming a cascade unmentioned anywhere else I have read, online or via the several waterfall books of our area. "Ethan Cascades" seems a fitting name indeed. There must be a good story waiting there behind that entry. Quite a bit packed into that little Ethan pond trip! Chris . . . when someone with your experience and knowledge offers such kind words, it is indeed flattering! Thank you! Great and very enticing report, John! A well-known bushwhacker called those "Scott's Cascades," since they were first seen (as far as anyone knows) by AMC adventurer A.E. Scott and two companions in 1882 near the end of a week-long epic across the Bond Range and then up over Mt. Field. That old logging road is amazing. I always wondered what it would be like to follow that brook all the way in to that high plateau under the steep west face of Mt. Field. Thank you Steve! Kudos from you are always valued! Also, thank you for providing the interesting information about the alternative (or preferred?) name for those cascades. I agree with all the above comments, John. This is a terrific post packed with great photos and wonderful information. And who knew about world-wide pinhole photography day? Certainly not me! I love your opening and closing remarks about those silly "But wait, there's more!" TV ads. And at the end of those commercials they always include: "If you act now, we'll DOUBLE this amazing offer!" 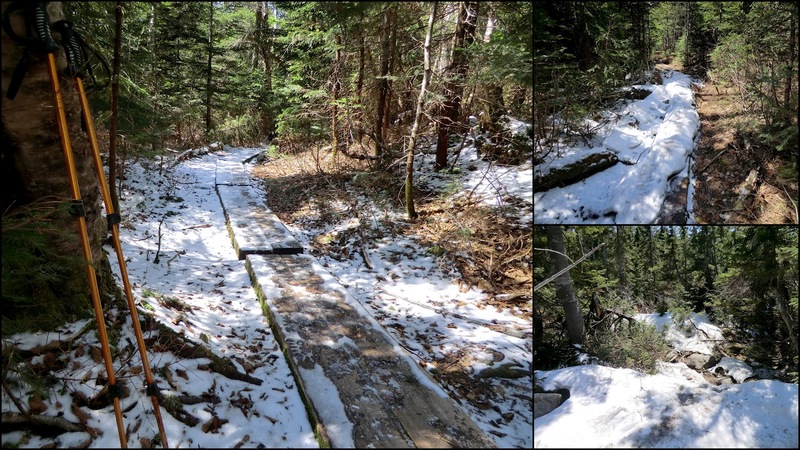 Well, that's what you've done with this post too—not only adding "more" but doubling, (or maybe even quadrupling) info and interest about the trek to Ethan Pond! Excellent Report and photos John. I wonder how many non-trailed beauties there are like that in the WMNF. Your report also comes with impeccable timing for me. A couple friends and I will be bush-whacking to West Field from that general area possibly as soon as this Saturday. I will be paying those cascades a visit. What direction was that logging road heading in if you don't mind my asking? Hey Joe . . . thanks for your comments! Regarding your question about the logging road, it was heading generally in a westerly direction (maybe just a tad south of west). And, if it indeed continued heading in that direction it should’ve eventually intersected with the North Fork, but it would’ve been at a point further south than I wanted to be. Hope your West Field adventure is awesome fun! I’ll look forward to reading your report! We have not yet visited Eyhan Pond and we are looking forward to it. Now we can also look forward to more! The photos are awesome. Certainly much more a reflection of their wonderful subjects and perspective than any possible negative effects (no pun intended) of the $97 camera. Great stuff! Hey Mark . . . glad you like the posting and the photos! I think you and Nat will enjoy Ethan Pond. It’s a nice trek at any time of year, but personally I think the Autumn season is the best time to visit.